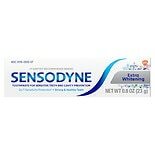 Shop Sensodyne Travel Size Sensitivity Toothpaste, Extra Whitening for Sensitive Teeth Travel Size (.8 oz. ).8 oz. 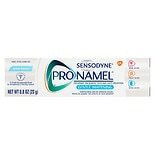 Shop Sensodyne Pronamel Gentle Whitening Fluoride Toothpaste to Strengthen and Protect Enamel Travel Size (.8 oz. ).8 oz. Shop AloeSense Naturally Soothing, Clinically-Proven Anti-Cavity Fluoride Toothpaste Fresh Mint, Travel Size (.75 oz. ).75 oz. $179$1 and 79 cents$1.79 / oz.